I'm having trouble with Unit of Measure for a WM material. The material used to work properly, but apparently not since the last change. Everything looks good to me and another material that went through the exact same changes works fine. Conversion rules says 1 CS is 20 EA. On the Material Document we can already see that the quantity of 35 CS is converted to 0.7 EA instead of 700. Then the TR is obviously wrong as well and so are all the TO since then. You can see that the previous TO were good. You can also see the values in table MARM for this material and the other one that works perfectly. It is a retail material but I don't think it matters much in this particular case ? 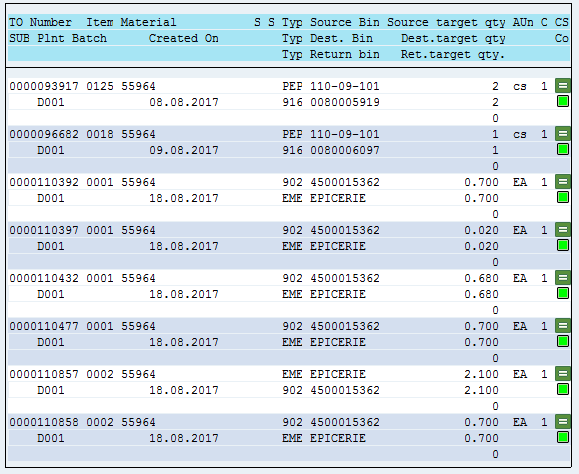 SAP does not allow to change the quantity conversion in the PO, as this could lead to inconsistencies. If you referenced a contract then check the contract, if there is an info record then check the info record. In any case you can already cancel your receipt, subsequent you then need to cancel the PO item, thereafter you have to correct your master data and then create a new PO item and do the new receipt. Please check the KBA 1607421: Units of measurement larger than 99999 in material master. It will explain why TR is getting rounded. Can you provide a screenshot from your purchase order item "Quantity and weights" tab ? Hi, The conversion is wrong there as well. If I create a new PO, i got the same conversion of 1000CS = 20 EA but I cannot modify it so it's not a user mistake.